S -18° 55' 0" and E 47° 47' 59"
Manjakandriana in Analamanga Region with it's 31,840 citizens is a town in Madagascar about 17 mi (or 28 km) east of Antananarivo, the country's capital city. Current time in Manjakandriana is now 10:52 PM (Saturday). The local timezone is named Indian / Antananarivo with an UTC offset of 3 hours. We know of 8 airports near Manjakandriana. The closest airport in Madagascar is Ivato Airport in a distance of 23 mi (or 36 km), West. Besides the airports, there are other travel options available (check left side). There is one Unesco world heritage site nearby. It's Royal Hill of Ambohimanga in a distance of 117 mi (or 188 km), North. Located at -18.9167, 47.7997 (Lat. / Lng. ), about 0 miles away. 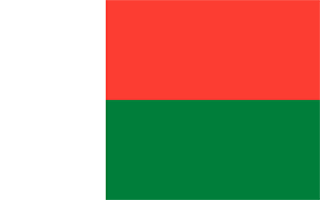 Antanandava is a town and commune in Madagascar. It belongs to the district of Moramanga, which is a part of Alaotra-Mangoro Region. The population of the commune was estimated to be approximately 9,000 in 2001 commune census. Primary and junior level secondary education are available in town. The majority 99% of the population of the commune are farmers. The most important crops are rice and beans, while other important agricultural products are sugarcane and bambara groundnut. Located at -19.0833, 47.95 (Lat. / Lng. ), about 15 miles away. 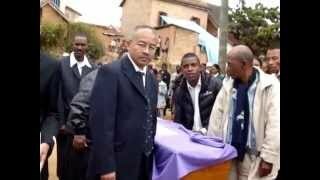 Sabotsy Anjiro is a town and commune in Madagascar. It belongs to the district of Moramanga, which is a part of Alaotra-Mangoro Region. The population of the commune was estimated to be approximately 15,000 in 2001 commune census. Primary and junior level secondary education are available in town. The majority 80% of the population of the commune are farmers. The most important crop is rice, while other important products are beans and cassava. Located at -18.8833, 47.9667 (Lat. / Lng. ), about 11 miles away. Located at -18.8667, 47.6833 (Lat. / Lng. ), about 8 miles away. Located at -18.9333, 47.9 (Lat. / Lng. ), about 7 miles away. Ambohitrandriamanitra is a town and commune in Madagascar. It belongs to the district of Manjakandriana, which is a part of Analamanga Region. The population of the commune was estimated to be approximately 8,000 in 2001 commune census. Primary and junior level secondary education are available in town. The majority 87% of the population of the commune are farmers. The most important crops are rice and beans, while other important agricultural products are cassava and potatoes. Located at -19.0833, 47.7833 (Lat. / Lng. ), about 12 miles away. Located at -18.7833, 47.8 (Lat. / Lng. ), about 9 miles away. Located at -18.85, 47.7167 (Lat. / Lng. ), about 7 miles away. Located at -19.0167, 47.8333 (Lat. / Lng. ), about 7 miles away. Located at -19.0333, 47.7833 (Lat. / Lng. ), about 8 miles away. Located at -18.8167, 47.85 (Lat. / Lng. ), about 8 miles away. Located at -18.9, 47.7167 (Lat. / Lng. ), about 6 miles away. Located at -18.9, 47.7833 (Lat. / Lng. ), about 2 miles away. These are some bigger and more relevant cities in the wider vivinity of Manjakandriana.